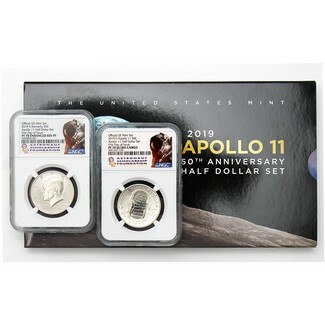 The set includes one Apollo 11 50th Anniversary Proof Clad Half Dollar NGC PF70 Ultra Cameo FDI and one Kennedy Enhanced Reverse Proof Clad Half Dollar NGC Reverse PF70 FDI to commemorate the enduring relationship between President Kennedy and the American space program. Maximum mintage for the 2 coin set is limited to only 100,000 sets. It is the only source of acquiring the one and only Kennedy Enhanced Reverse Proof Clad Half Dollar that has ever been made. OGP and COA included.